Mannlicher M 1888 rifle Cal. 8mm s# 100562 on crossguard. Very good bright blade with square fullers and some stains but no pitting. Austrian makers name OEWG on the ricasso. Bright polished pommel and crossguard with muzzle ring MRD 16.5 mm and fastener on top. There is a crisp Bulgarian rampant lion marking on the crossguard. Excellent wooden grips secured to the blade tang by two rivets. 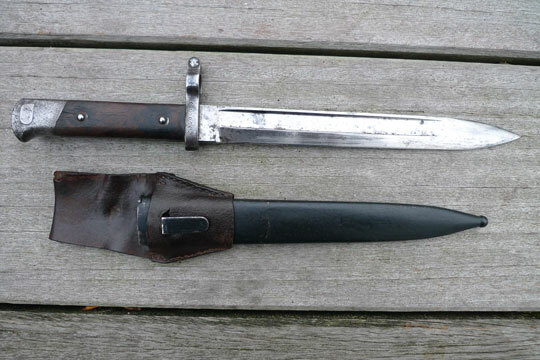 Excellent black painted scabbard. No dents. Comes with a not indentified brown leather frog as found in a VGC- condition.